A very large area of showers and storms is organizing about 375 miles east of the southern Windwards. 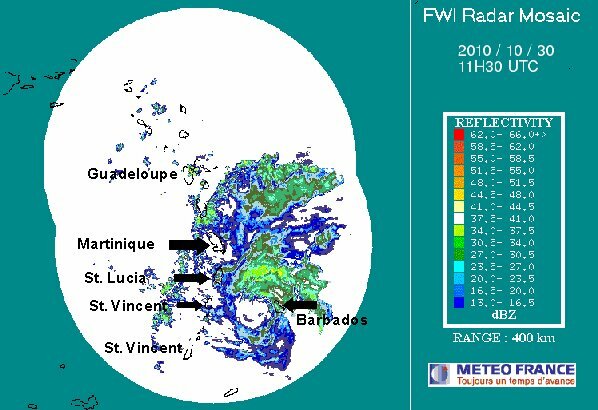 The first band of showers has already moved into the southern Windwards. Rain and wind will pick up today into Saturday as the low organizes. 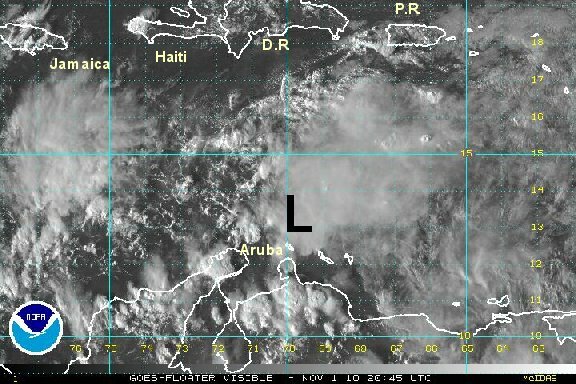 Interests in the Lesser Antilles, especially Windwards should follow this tropical disturbance closely. With this system so far south, south america may inhibit development if it stays too far south. If the low stays north, development is likely. 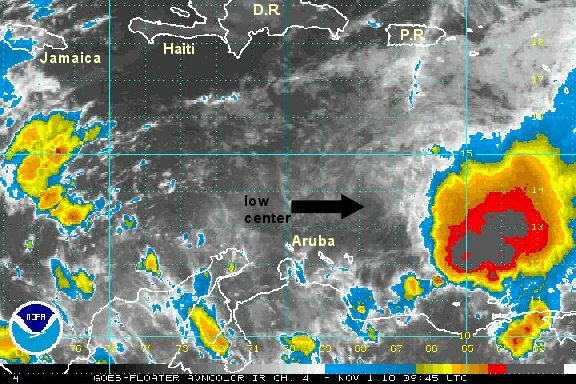 As of 7 am edt /ast the disturbance was centered near 10.0° N / 56.0° W or about 375 miles east southeast of the southern Windwards. Top sustained winds are estimated at 30 mph. Movement - west northwest 15-20 mph. Pressure estimated at 1006 mb. Forecast models take this system east northeast through the Windwards the next 1-2 days. Early to mid next week it is forecast into the central Caribbean where is should turn north. Longer range forecasts show it recurving in the central Caribbean from near Jamaica to Hispaniola then north into the Atlantic near or east of the Turks and Caicos. Tomas up to 40 mph on the 5 pm advisory. A complete update will be filled later tonight. Tomas is a large tropical storm. The low has developed far enough north so that the interaction with land will be minimized (south america). The Windwards will take the brunt of Tomas into Saturday, although strong squalls are possible in the Leewards also. 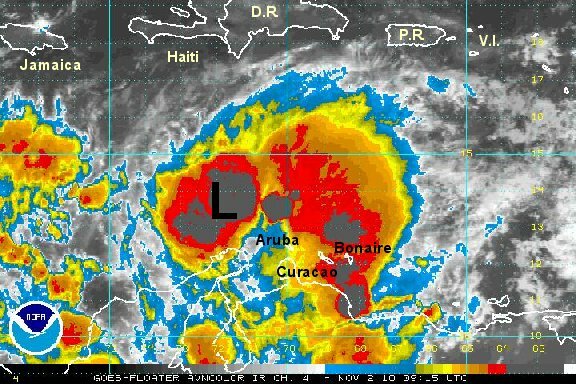 The is a large area of deep convection to the north of the center of tomas. It is rotating toward Martinique and St. Lucia, very heavy rain and gusty winds will accompany this area of convection late tonight into Saturday. As of 11 pm edt /ast the tomas was centered near 12.2° N / 58.4° W or about 100 miles southeast of Barbados. Top sustained winds are estimated at 60 mph (65 mph estimate - 11 pm advisory NHC). Movement - west northwest 16 mph. Pressure estimated at 997 mb. Forecast models take this system east northeast through the Windwards Saturday. Early to mid next week it is forecast into the central Caribbean where is should turn north. Longer range forecasts show it recurving in the central Caribbean from near Jamaica to Hispaniola then north into the Atlantic near or east of the Turks and Caicos by Friday or next Saturday. Tomas has the potential to become a major hurricane and should be followed closely! 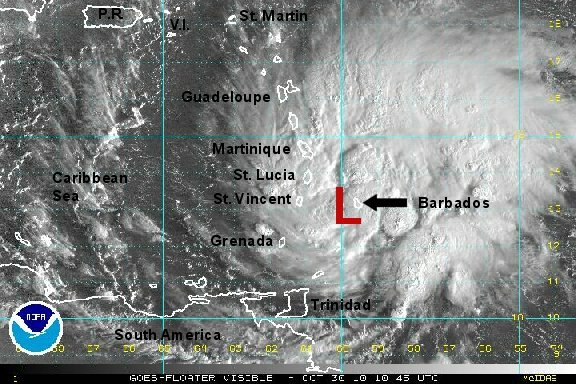 As of 7 am edt /ast Tomas was centered near 13.0° N / 60.0° W or about 20 miles southwest of Barbados / 90 miles east of St. Vincent. Top sustained winds are estimated at 60 mph (70 mph estimate - 5 am advisory NHC). Movement - west northwest 15 mph. Pressure estimated at 994 mb. Forecast models take this system east northeast through the Windwards today. Early to mid next week it is forecast into the central Caribbean where is should slow and turn north. Longer range forecasts show it recurving in the central Caribbean from near Jamaica to Hispaniola then north into the Atlantic near or east of the Turks and Caicos by Friday or next Saturday. Tomas has the potential to become a major hurricane and should be followed closely! The worst of Tomas is moving into Martinique, and St. Lucia. Tomas does not have sustained winds of 70 mph. That is an overestimation. Tomas has organized today with an eye clearly visible on the radar. Two areas of deep convection are apparent. One is near the eye and the other band east of the Islands still. 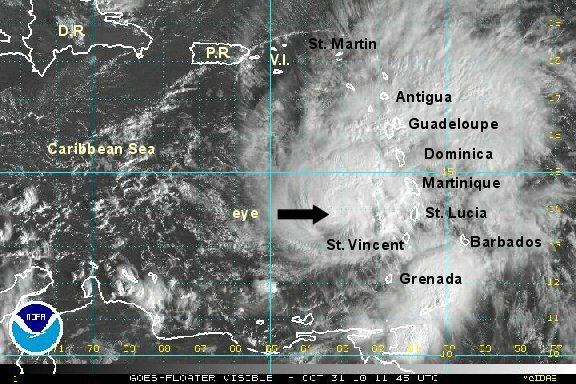 The strongest winds occured from St. Vincent north to St. Lucia north to Martinique. As of 10 pm edt /ast Tomas was centered near 13.6° N / 61.9° W or about 65 miles northwest of St. Vincent / 75 miles west southwest of St. Lucia. Top sustained winds are estimated at 85 mph (90 mph estimate - 8 pm edt advisory NHC). Movement - west northwest 9 mph. Pressure estimated at 982 mb. The forecast calls for Tomas to move into the central Caribbean from near Jamaica to Hispaniola by Tuesday and Wednesday. It will then turn north across Hispaniola or through the Windward passage into the Atlantic near or east of the Turks and Caicos by Friday or next Saturday. Tomas has the potential to become a major hurricane and should be followed closely! Tomas strengthened overnight Saturday night with a large burst of deep convection over the center of circulation. Since then, the cloud tops have warmed considerably indicating some wekkening. We think that Tomas is weaker then what the hurricane center is estimating....again. Tomas has also slowed in speed, meaning that it's forecast track timeframe needed to be adjusted. Winds today are weaker in the Islands as Tomas has moved into the eastern Caribbean. The strongest winds that were indicated on the observations were in the neighborhood of 40 mph with gusts to 60 mph. It was likely that some gusts approached hurricane force in the mountains, otherwise winds were considerably lower than the hnc official forecast. As of 8 am edt /ast Tomas was centered near 14.0° N / 63.3° W or about 155 miles west of St. Lucia / 355 south southeast of San Juan, Puerto Rico. Top sustained winds are estimated at 90 mph (NHC 100 mph estimate - 8 am edt advisory). Movement - west northwest 8 mph. Pressure estimated at 983 mb. As expected the hurricane center has dropped windspeed to 90 mph. The latest satellite imagery shows that Tomas is being sheared. Our wind estimate is 75 mph. Wind shear should be an issue for the next couple of days. We will have a complete later this evening. 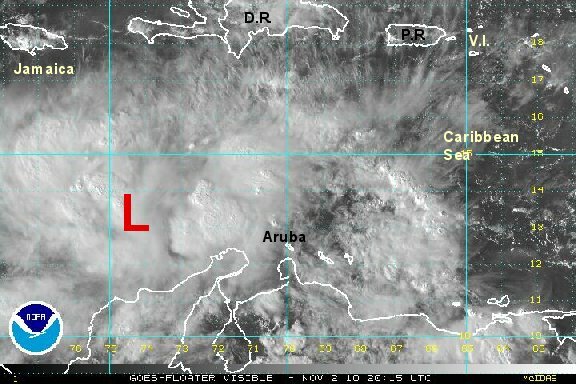 Wind shear has ripped convection from the circulation. NHC dropped winds to match our earlier estimate. We still think that it is weaker than the offical estimate of 75 mph. With a pressure up to 996 mb, there is no way that Tomas is still a hurricane. Wind shear may relax before the northward turn in a few days. Interests in Haiti and the Dominican Republic will need to follow the progress of Tomas closely. As of 5 pm edt /ast Tomas was centered near 14.4° N / 64.9° W or about 265 miles west of St. Lucia / 290 south southeast of San Juan, Puerto Rico. Top sustained winds are estimated at 60 mph (NHC 75 mph estimate - 5 pm edt advisory). Movement - west 12 mph. Pressure estimated at 996 mb. Tomas is still scheduled to move into the central Caribbean, then turn north toward Hispaniola by Thursday / Friday. If Tomas crosses Hispaniola it will greatly disrupt the circulation. That would be bad news for Haiti and the Dominican Republic, and good news for the Turks and Caicos. Tomas will be fighting shear for a few more days and may stay as a tropical storm. Restrengthening is possible before reaching Hispaniola as the wind shear is predicted to relax. As expected, the hurricane center dropped their winds way down last night. 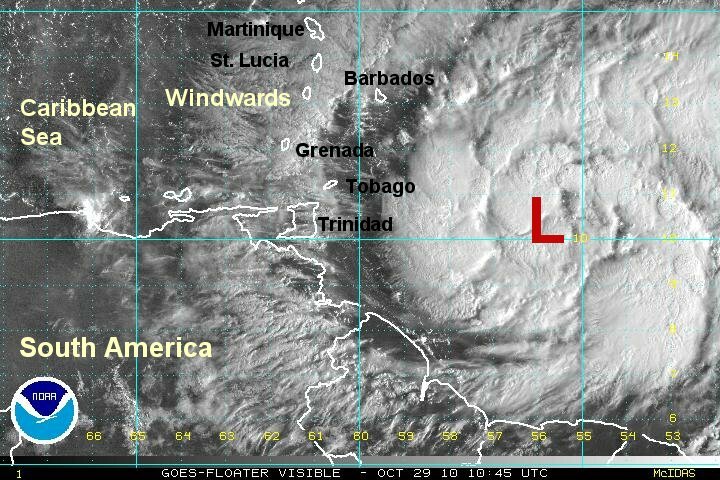 The low center is stripped of convection. Winds with the low itself are 45 mph at the strongest. 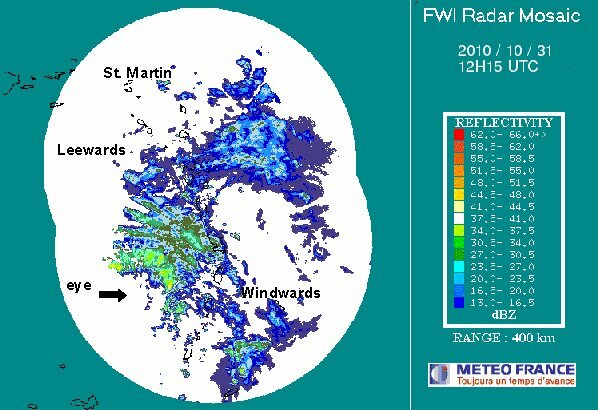 The strongest winds are actually to the east of the low center and west of the Windwards. Very heavy rain and the strongest winds are over the open southeastern Caribbean. As of 7 am edt /ast Tomas was centered near 13.8° N / 67.8° W or about 125 miles northeast of Curacao. Top sustained winds are estimated at 45 mph (NHC 50 mph estimate - 5 am edt advisory). Movement - west 14 mph. Pressure estimated at 1004 mb. Tomas will continue in the central Caribbean, then turn north toward Hispaniola by Thursday. If Tomas crosses Hispaniola it will greatly disrupt the circulation. That would be bad news for Haiti and the Dominican Republic, and good news for the Turks and Caicos. Tomas will be fighting shear for a few more days and may stay as a tropical storm. 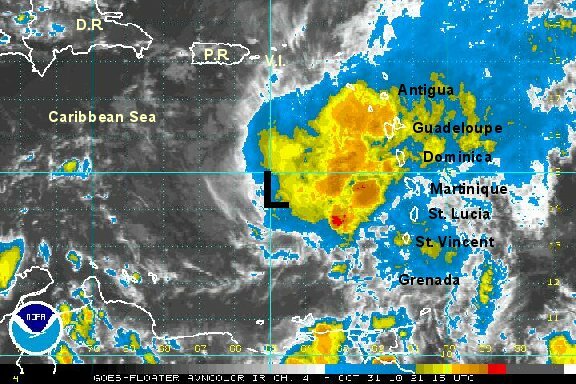 Restrengthening is possible before reaching Hispaniola as the wind shear is predicted to relax. After this, it is predicted to move north rapidly into the Atlantic near or east of the Turks and Caicos by late Friday or Saturday. The first visible satellite images are coming in and showing that Tomas is much weaker. There is almost no convection with the circulation center. It is probably barely holding on as a tropical storm. A generous estimate would be 40 mph. The strongest winds are well east of the center under the convection. We'll be watching to see it the convection tries to make a comeback over the next couple of days. The weakening phase is over. Strengthening is starting again. 45-50 mph is our estimate at this time. A complete update will be filed this evening. Deep convection has built over the center of circulation indicating that the weakening phase has stopped. We are in agreement with the hurricane center that arc clouds are present. This does indicate that Tomas is no more organized than earlier today. Tomas continues to fight dry air to the west and wind shear from aloft. It looked like a restrengthening phase was starting earlier with the deep convection. The strengthening has not started yet. It Tomas stays weak its motion will be controlled more by the low level flow taking it farther west. Toma's presentation is still poor on the Aruba radar. BTW - this is about as close to Aruba as you will see a tropical cyclone get. Even at this distance, most of the rain / wind is well north of Aruba and not much of a concern at all. As of 5 pm edt /ast Tomas was centered near 13.4° N / 69.7° W or about 65 miles north northeast of Aruba. Top sustained winds are estimated at 45 mph (NHC 45 mph estimate - 5 pm edt advisory). Movement - west 12 mph. Pressure estimated at 1005 mb. Tomas will continue in the south central Caribbean, then turn north toward Hispaniola by Thursday....assuming that the wind shear dies down allowing Tomas to strengthen some. IF this does not occur, Tomas will move father west than the official hurricane center forecast. Later in the week tomas is predicted to move north and cross Hispaniola. The circulation will be badly disrupted if that happens. That would be bad news for Haiti and the Dominican Republic, and good news for the Turks and Caicos. Tomas will be fighting shear for a few more days and may stay as a tropical storm. 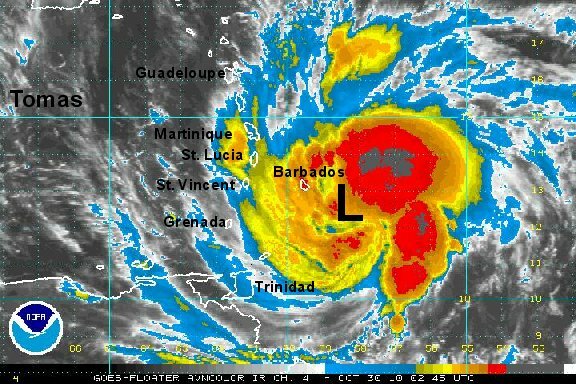 Restrengthening is possible before reaching Hispaniola as the wind shear is predicted to relax. After this, it is predicted to move north rapidly into the Atlantic near or east of the Turks and Caicos by late Friday or Saturday. A large burst of deep convection has appeared once again with Tomas, indicating that a slow restrengthening phase is beginning. 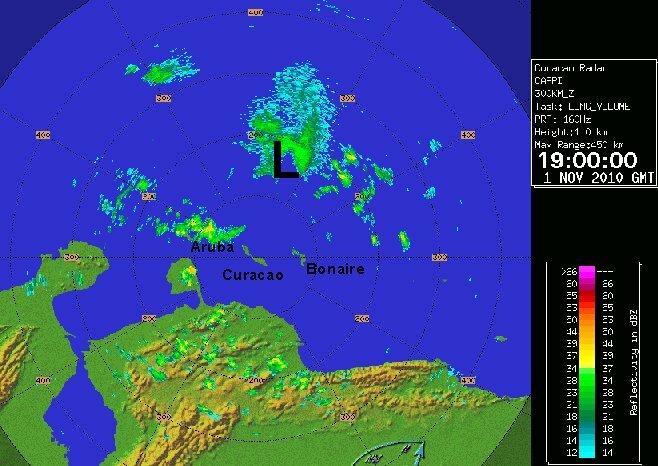 Some of the storms brought heavy thundershowers to Curacao and Bonaire. No winds of any consequence were reported though. It appears that the wind shear has lessened which will allow for some strengthening. As of 8 am edt / ast Tomas was centered near 13.5° N / 72.2° W or about 360 miles south of Port Au Prince, Haiti / 435 southeast of Kingston, Jamaica. Top sustained winds are estimated at 50 mph (NHC 50 mph estimate - 5 am edt advisory). Movement - west 12 mph. Pressure estimated at 1003 mb. The forecast is overall unchanged, except for the long range. Tomas is northwest of Aruba. It is expected to slowly make a turn to the northwest, then north over the next couple of days. That will take it east of Jamaica and probably close to Haiti. Unfortunately, it is quite possible that Tomas will have better conditions to restrengthen before moving into Haiti. By late Friday or Saturday, Tomas is expected to move into the Atlantic near or east of the Turks and Caicos. It's strength will largely depend on how much of Haiti Tomas crosses. Tomas is expect to make an east northeast turn with a slow moving front after this. That will put it north of Puerto Rico by 100-200 miles later Sunday into Monday. It is too early to tell how strong Tomas will be north of Puerto Rico or even if Puerto Rico will see any significant effects. If it is indeed that far north, effects should not be that substantial. No appreciable development has occurred today. A large area of deep convection exists, but it is not particularly organized. Because of the lack of organized structure and slightly higher pressure; we are in agreement with the hurricane center that Tomas is weaker this afternoon. As of 5 pm edt / ast Tomas was centered near 13.5° N / 74.6° W or about 385 miles south southwest of Port Au Prince, Haiti / 345 south southeast of Kingston, Jamaica. Top sustained winds are estimated at 40 mph (NHC 40 mph estimate - 5 pm edt advisory). Movement - west 14 mph. Pressure estimated at 1006 mb. Tomas is in the southwestern Caribbean. It is expected to slowly make a turn to the northwest, then north over the next couple of days. That will take it east of Jamaica and probably close to Haiti. Unfortunately, it is quite possible that Tomas will have better conditions to restrengthen before moving into Haiti. By late Friday or Saturday, Tomas is expected to move into the Atlantic near or east of the Turks and Caicos. It's strength will largely depend on how much of Haiti Tomas crosses. Tomas is expected to make an east northeast turn with a slow moving front after this. That will put it north of Puerto Rico by 100-200 miles later Sunday into Monday. It is too early to tell how strong Tomas will be north of Puerto Rico or even if Puerto Rico will see any significant effects. If it is indeed that far north, effects should not be that substantial.